Rakusan did not include the Fan Series in his main sequence numbering. Therefore, the original number used for each of the 36 Series prints has been modified to identify the Fan Series members of its theme. The five different fan silhouette shapes have been here assigned arbitrary numbers 1 through 5. To indicate a fan design these shape designations are added to the 36 Series number separated by a hyphen. In themes which contain duplicated fan shapes, one has been arbitrarily designated A and the other B. 120-3 indicates that this is a Fan Series design with fan shape 3 in the 120 Tea Flower theme. Like all other designs in this series, 120-3 was only produced in a single print run, and few copies are currently documented. The Fan Series delivery documents for installment six in September 1934 announced that tea flower designs would be published the following month. Those for installment seven confirm that the Fan Series of the 120 Tea Flower theme were printed during October 1934 and distributed October 15, 1934 as part of installment seven (of twelve). 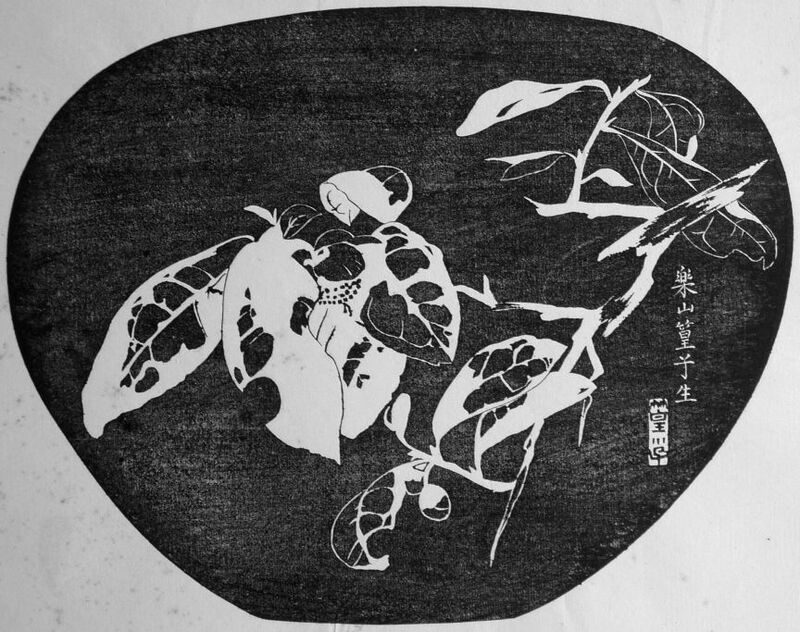 On both sets of delivery documents Rakusan used the theme subject title 茶の花, cha no hana, 'tea flower' which is the original title of 36 Series design 120 published at the same time. The 120 Tea Flower theme includes only three fan designs, two less than the normal quintet, and is the smallest theme in the series. There are designs for fan shapes 3, 4, and 5, but none for fan shapes 1 and 2. Rakusan had originally planned the 120 Tea Flower theme to have its full complement of five designs. From the signature and seal markings, it appears that Rakusan created 120-5 at the end of 1933, and the next two designs (120-3 and 120-4) shortly thereafter in the early part of 1934. Subsequently, he painted 120-0 as the model for the 36 Series design 120. 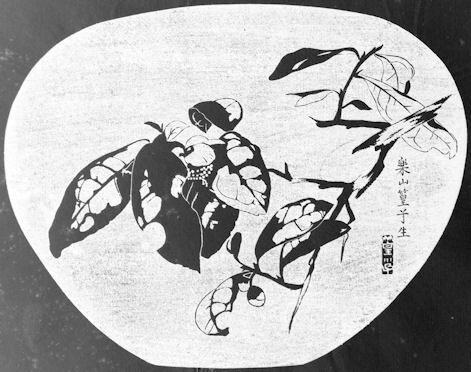 The tea flower fan designs were among several groups Rakusan then set aside, intending to complete each of them with additional designs later. Although most such groups were indeed eventually infilled and published as regular themes, Rakusan modified his original plans for four of these incomplete groups. He decided to assemble installment seven using existing designs only. Since each installment was supposed to have three themes, two of the incomplete groups with four designs each (bamboo-grass and pine) were merged into a single compound theme with eight designs. To this he added the three tea flower designs and the four nandina designs to make up the required installment total. As a result, installment seven ended up with the advertised fifteen designs in three themes, but each of its themes, 119, 120, and 121, is exceptional; and none has a perfect quintet of designs. Tea, Camellia (Thea) sinensis, 茶, cha, is an originally exotic shrub which is now a common agricultural crop in Japan. Its leaves are harvested to make various kinds of tea. The closely trimmed plants are often supported by bamboo stakes as shown in 61. Tea plants typically flower in the winter months.